For the list of post-1969 NFL champions, see List of Super Bowl champions. 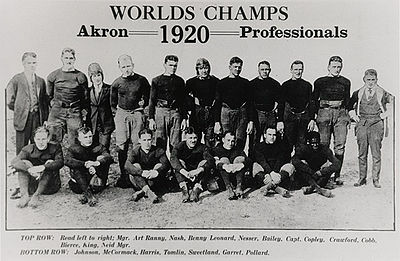 The 1920 Akron Pros were named the first APFA (NFL) champions. The National Football League champions, prior to the merger between the National Football League (NFL) and American Football League (AFL) in 1970, were determined by two different systems. The National Football League was established on September 17, 1920, as the American Professional Football Association (APFA). The APFA changed its name in 1922 to the National Football League, which it has retained ever since. From 1921 to 1931, the APFA/NFL determined its champion by overall win–loss record, with no playoff games; ties were not counted in the winning percentage total. The APFA did not keep records of the 1920 season; they declared the Akron Pros, who finished the season with an 8–0–3 (8 wins, 0 losses, 3 ties) record, as the league's first champions, by a vote of the owners, with the Buffalo-All Americans and Decatur Staleys also claiming the title. According to modern-tie breaking rules, the Buffalo All-Americans tied Akron for the championship. The Canton Bulldogs won two straight championships from 1922 to 1923, and the Green Bay Packers won three in a row from 1929 to 1931. There also has been controversy over the championshipships of the 1921 APFA season and the 1925 NFL season, with the Buffalo All-Americans laying claim to another championship in an incident known as the "Staley Swindle" and the Pottsville Maroons being stripped of their championship in 1925 for playing an exhibition game against college football powerhouse Notre Dame's famed Four Horsemen, leading to a last minute field goal victory for the Maroons, stunning the crowd and nation, and also put the NFL ahead of college football for the first time ever. These three disputed championships contributed to the beginning of the NFL's rich history. The 1932 NFL season resulted in a tie for first place between the Chicago Bears and Portsmouth Spartans, and could not be resolved by the typical win–loss system. To settle the tie, a playoff game was played; Chicago won the game and the championship. The following year, the NFL split into two divisions, and the winner of each division would play in the NFL Championship Game. In 1967, the NFL and the rival AFL agreed to merge, effective following the 1969 season; as part of this deal, the NFL champion from 1966 to 1969 would play the AFL champion in an AFL–NFL World Championship Game in each of the four seasons before the completed merger. The NFL Championship Game was ended after the 1969 season, succeeded by the NFC Championship Game. The champions of that game play the champions of the AFC Championship Game in the Super Bowl to determine the NFL champion. The Green Bay Packers won the most NFL championships before the merger, winning eleven of the fifty championships. The Packers were also the only team to win three straight championships, an achievement they accomplished twice: from 1929–31 and from 1965–67. The Chicago Bears won a total of eight titles, and the Cleveland Browns, Detroit Lions, and New York Giants each won four. The Bears recorded the largest victory in a championship game, defeating the Washington Redskins 73–0 in the 1940 NFL Championship Game; six other title games ended in a shutout as well. The Philadelphia Eagles recorded two consecutive shutouts in 1948 and 1949. New York City hosted the most championship games (eight), while the highest-attended title game was the 1955 NFL Championship Game, where 85,693 fans showed up in Los Angeles to watch the Browns beat the Rams 38–14. Champion determined by win–loss percentage. The number in parentheses indicates the number of championships the franchise had won to that point. Numbers in parentheses in the table indicate the number of times that team won the NFL championship as of the championship game. Teams winning the NFL Championship during these years move onward to compete in the first four Super Bowls. The Green Bay Packers continued on to win the first two Super Bowls. The latter two teams, the Baltimore Colts and Minnesota Vikings, lost in their respective Super Bowls. These two losing teams are still credited with the NFL Championship in their official record. ^ a b Ties were disregarded in the standings. ^ No official standings were recorded for the 1920 season and teams played games against opponents outside of the league. The championship was awarded to the Akron Pros in an APFA meeting on April 30, 1921. ^ Chicago beat Buffalo on a controversial tiebreaker. ^ Chicago was awarded the championship controversially because the Maroons had been suspended from the NFL for playing an exhibition game against a group of Notre Dame All-Stars. ^ Chicago and Portsmouth finished with identical win–loss records, tying for first place in the NFL. To solve the tie, a playoff game was held between the two, counting towards the regular-season total. Chicago won the game and the championship while Portsmouth's loss dropped them to third place, behind Green Bay. ^ Green Bay beat the American Football League's Kansas City Chiefs 35–10 in Super Bowl I. ^ Green Bay beat the AFL's Oakland Raiders 33–14 in Super Bowl II. ^ Baltimore lost to the AFL's New York Jets 16–7 in Super Bowl III. ^ Minnesota lost to the AFL's Kansas City Chiefs 23–7 in Super Bowl IV. ^ "Sept. 17, 1920 – The Founding of the NFL". Pro Football Hall of Fame. Retrieved July 9, 2012. ^ a b c d e "NFL Champions". Pro Football Hall of Fame. Retrieved January 15, 2013. ^ a b Piascik, Andy (2005). "Old and New Style: Winning Percentages" (PDF). The Coffin Corner. Professional Football Researchers Association. 27 (5). Retrieved January 11, 2016. ^ a b c d e f g Past Standings, p. 27. ^ Bell, Jarrett (June 30, 2009). "From upstart to big time, how the AFL changed the NFL". USA Today. Retrieved January 15, 2013. ^ a b c d e f g h i j k l m n o p q r s Playoff Game Summaries, p. 4. ^ Snyder, Gib (January 6, 2012). "Buffalo: A city cursed with bad sports luck". The Observer. Ogden Newspapers. Archived from the original on July 29, 2013. Retrieved January 16, 2013. ^ a b c d e f g h i j k l m n Past Standings, p. 26. ^ a b c d e f g h i j k l Past Standings, p. 25. ^ a b c d e f g h i j Past Standings, p. 24. ^ a b c d e f g h i j k l m n o p q r s Playoff Game Summaries, p. 3. ^ a b c d e f g h i j k l m n Past Standings, p. 22. "Past Standings" (pdf). NFL.com. Retrieved January 14, 2013. "Playoff Game Summaries" (pdf). NFL.com. Retrieved January 14, 2013. This page was last edited on 22 March 2019, at 14:21 (UTC).